It has been a long week, filled with peanut butter n' jelly sandwiches and TacoBell. That's what happens when you move across the country and are busy unpacking boxes, hoping the next box is the one that has your kitchen supplies in it. And after unpacking fifty boxes and not finding a single pan, I have come to accept that my moving strategy of not labeling boxes is a bad plan. And yes, I know the hubster is shaking his head saying, "I told you so." So today, when I finally found a pan, the hubster and I did a little victory dance. And then, mid-victory dance, the hubster says, "I think I want a salad for lunch." I stopped dancing and looked at the hubster, a 5'10" staunchly carnivorous man, affectionately nicknamed Giant. "A salad?" I asked. "Yeah, something light and refreshing but with lots of flavor," he said. It was official. All of the moving truck fumes had gone to the hubster's head and he emerged a delicate foodie with a penchant for salads. Awesome. 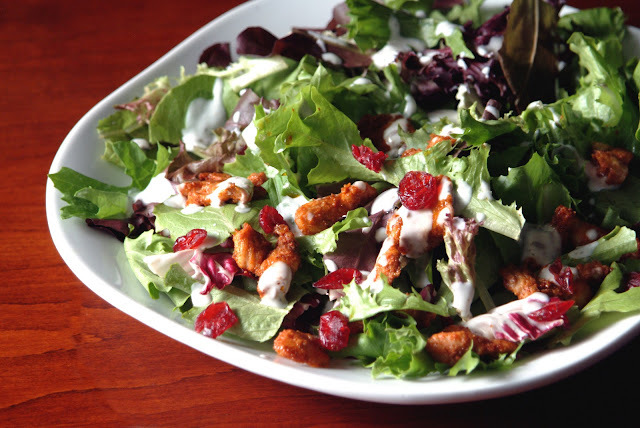 Enter the Chicken Tikka Salad with Cranberries and Lime Yogurt Dressing. 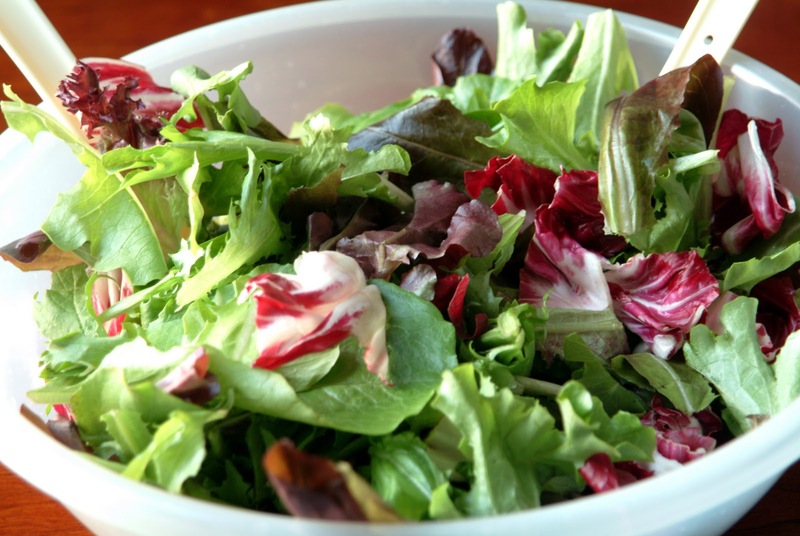 The salad leaves are from the Fresh Express Spring Mix, a fabulous blend of baby romaine, tango and radicchio. It is, quite possibly, the best thing since, well, salad in a bag. The fresh and crunchy blend saves you from buying numerous bunches of lettuce, washing and drying the leaves, and tearing them up when you're starving. 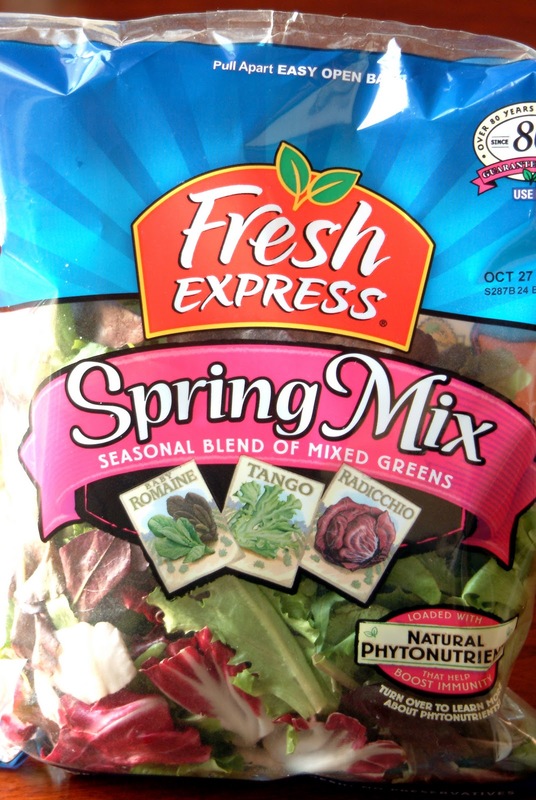 I've also made this salad with the Fresh Express 50/50 Mix and the Fresh Express Baby Spinach and it is equally delicious. The chicken tikka bites, fragrant with a blend of South-Asian spices, are so much more interesting and flavorful than plain ol' grilled chicken. The lime yogurt dressing provides the perfect cooling touch to the spicy chicken. And the cranberries? They're the surprising sweet touch to complement this salad. So, I whipped us up a light and refreshing salad with lots of flavor. Because I figured I owed the hubster after forcing him to unpack box after unlabelled box. And then, we ate it in a giant communal bowl with spoons because we have yet to find our plates and forks. Ah, the joys of moving mitigated only by a fabulous and delicious salad. This post is a submission to the Fresh Express Salad Challenge for FoodBuzz. Fresh Express sent coupons to try their products but I think my coupons got lost in the mail with the move but I'm crossing my fingers they get routed to our new address because the Fresh Express salads are so, so tasty. Cut chicken into cubes. Add yogurt and all of the spices and mix thoroughly. Heat 1-2 tablespoons of oil in a pan. Cook chicken. Alternatively, you can thread the chicken onto wooden skewers and broil until cooked. 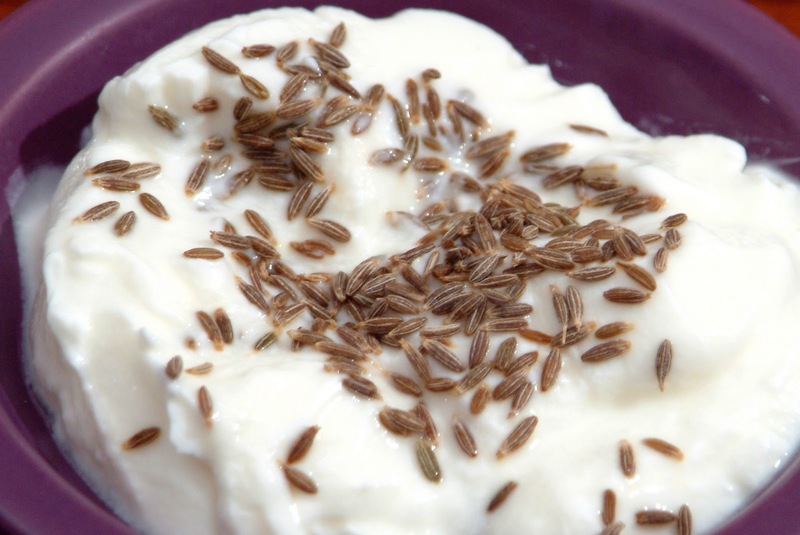 Mix all ingredients together (you may need to thin it out with 1 teaspoon of water, depending on how thick your yogurt is, particularly if you're using Greek yogurt). This is an awesome salad! I initially though the chicken was tandoori style. And I like the yogurt dressing. So many boxes to go through, and unlabeled. The lessons we learn but I hope you don't have to move any time soon. 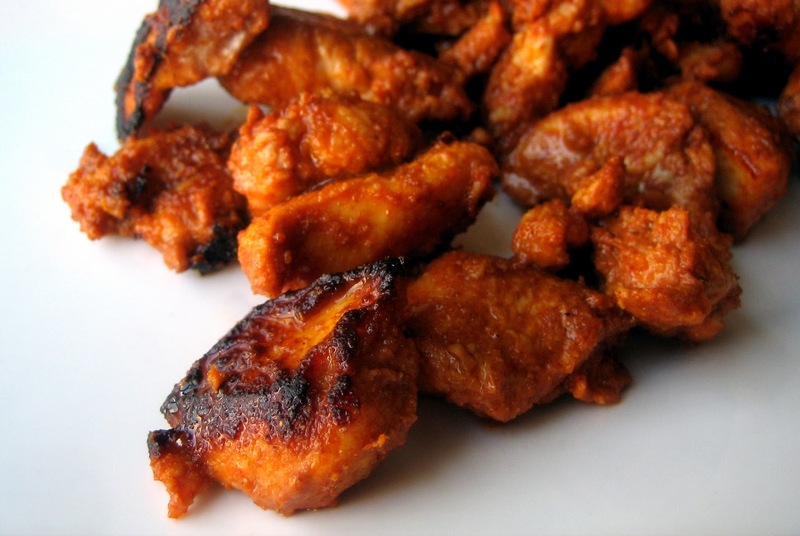 Back in the days that I enjoyed chicken, Chicken Tikka was my favorite thing ever! I'd drop it in a salad, add some croutons and Caesar dressing and even Ali loved it. This looks awesome Azmina. Sorry to say that I'm with your husband on labeling. I label everything! I even label my husband's sweaters according to style..."v-neck, etc." Will you still be my friend even though I'm certifiable? Great idea! I love salads, I eat them everyday but sometimes it gets boring. Your salad looks lovely and flavorful! great idea! This is an impressive salad for not having most of your kitchen supplies together! I'm pretty sure if I showed this to my husband he'd want it immediately because it not only is a salad (he's been on this salad kick lately), but it would be an excuse to bust out his spice grinder. Not gonna lie--this looks pretty darn good to me too. This sounds delicious.. Mountain Man and I just got done with a move as well so I know what you mean about the fast food kinda week! Not going to lie, at the end of it all we looked at eachother and decided we would be eating salads/veggies for at least the next week... so this looks perfect! Yay for finding the pan! Finding anything in a move is just short of a miracle. Box jungle nightmares!! That salad looks awesome! Totally stealing it. I'm not usually a salad fan, but I could definitely enjoy this. This salad sounds really good, I love the dressing. Glad you are getting settled! Moving, unpacking and COOKING??? You are super woman! Your salad looks incredible and I can envision what it smells and tastes like... delicious. Must try that one! Congrats on at least finding one pan and rejoining the blogging world. I've missed having you here. The salad does look delicious! oh this looks great! hope the unpacking is going well! I guess my husband is the "delicate" type, too, LOL! We have salads almost every night (to justify all the other food) per his request. I think it's because they are a must for me everyday, it seems like a chore. This dressing seems really easy, though. Actually, this sounds good for dinner tonight, hmm. I really like, and, in fact, they are my best friend at time saving is those pre-made salads that have delicately been cleaned and all ready for dressing... I was using (only during the week of course) low cal dressing, but it has fake sugar, fake this, and fake that in order to get it low cal.. what I love about yogurt dressing, is, it can be fat free, and you can add all the herbs to bring out taste without guilt.. Moving is an insane exorbitant expense. Mmmmmmm! This salad looks really good to me right now...I must be craving greens...and the spice combo...gotta have it! By the way, have you tried toasting your cumin seeds? You had me at Tikka! This salad sounds and looks like one of the best salads ever. Good job , yum yum! HA! It's always a shocker when my husband asked for salad. I usually have to fan myself so I don;t hit the ground. Gorgeous, GORGEOUS salad. I want one! Mmmm...definitely a great, flavorful salad! The dressing is one I'm going to whip up myself right now for my delicate self, after too much indulgence. My dad asks for salad a lot...hmm...maybe there is something wrong with them. I'm glad you're getting your post back on! I'm going to do this the next time I want a salad with chicken on it. Hands down all of my fav spices, plus with yogurt! Perfectly delicious! Good for you for putting the energy into making a healthy delicious meal despite the chaos! I like this recipe, thanks for sharing :) the salad looks so fresh and the chicken pieces very tasty! My hubby is a salad freak and its usually him that requests it before me so thanks for this new recipe !! Unlabeled boxes...oh boy, you don't say! Love the express salad, love the zesty fresh flavours...and of course love the communal bowl! A memorable first meal in the new home! Congrats on the move - hope you get settled soon! Maybe I should force my brother and father to move across the country so that they'll start craving vegetables. That seems like an effective plan don't you think? This salad looks fantastic. I love the variation of flavors in it. 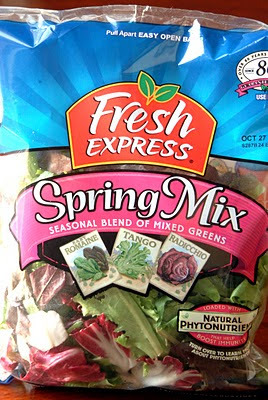 I'm going to head out and buy some spring mix and get working on this deliciousness. what a lovely salad. this looks so good. i know my husband would love this..thank you for sharing this. and congrats on the move. yay! We might be sisters Azmina! I too am too darn unorganized when it comes to labeling boxes and all that but luckily my husband doesn't give up on me and gets the labels, starts putting it up. Makes me feel guilty and then Duh! I do it! I love what you did to that lowly bag of salad. YUM! This salad still looks delicious a month later ;) I crave salad, esp. after traveling! Love chicken tiki and yogurt dressing is the perfect complement. I had to find a way to turn the tikka masala I had marinating into a salad. So happy your blog turned up. I had cilantro, bell peppers and green onions in the salad too. I totally suggest them! Honestly, when I tasted the dressing alone, I was worried that it was too sour. But once combined with the chicken and salad, it was awesome. Thanks for this idea.